Albert François Lebrun (French: [albɛʁ ləbʁœ̃]; 29 August 1871 – 6 March 1950) was a French politician, President of France from 1932 to 1940. He was the last president of the Third Republic. He was a member of the center-right Democratic Republican Alliance (ARD). Born to a farming family in Mercy-le-Haut, Meurthe-et-Moselle, he attended the École polytechnique and the École des mines, graduating from both at the top of his class. He then became a mining engineer in Vesoul and Nancy, but left that profession at the age of 29 to enter politics. Lebrun gained a seat in the Chamber of Deputies in 1900 as a member of the Left Republican Party, later serving on the cabinet as Minister for the Colonies from 1912–1914, Minister of War in 1913 and Minister for Liberated Regions, 1917–1919. Joining the Democratic Alliance, he was elected to the French senate from Meurthe-et-Moselle in 1920, and served as Vice President of the Senate from 1925 through 1929. He was president of that body from 1931–1932. Lebrun was elected president of France following the assassination of president Paul Doumer by Pavel Gurgulov on 6 May 1932. Re-elected in 1939, largely because of his record of accommodating all political sides, he exercised little power as president. On 10 July 1940, Lebrun enacted/promulgated the Constitutional Law of 10 July 1940 (see the Vichy 80) allowing Prime Minister Philippe Pétain to promulgate a new constitution. On 11 July, Lebrun was replaced by Pétain (although Lebrun never officially resigned) as head of state. He then fled to Vizille (Isère) on 15 July, but was captured on 27 August 1943 when the Germans moved into the region and was sent into captivity at the Itter Castle in Tyrol. On 10 October 1943 he was allowed to return to Vizille due to poor health, but was kept under constant surveillance. On 9 August 1944, when the Allies restored the French government, Lebrun met with Charles de Gaulle and acknowledged the General's leadership, saying that he had not formally resigned as president because the dissolution of the National Assembly had left nobody to accept his resignation. Lebrun was married to Marguerite Lebrun. Together they had two children: A son Jean and a daughter Marie. After the war, Lebrun lived in retirement. He died of pneumonia in Paris on 6 March 1950 after a protracted illness. ^ Loi constitutionnelle du 10 juillet 1940 (Constitutional Law of 10 July 1940). "...Fait à Vichy, le 10 juillet 1940 Par le président de la République, Albert Lebrun..."
^ Acte constitutionnel n° 1 du 11 juillet 1940 (Constitutional Act No. 1 of 11 July 1940). ^ Taylor, Edmund (11 May 1932). "France Gains A President And Loses A Premier". Chicago Tribune. Retrieved 16 July 2017. ^ "Albert Lebrun Taken by Death". Associated Press. 6 March 1950. Retrieved 15 March 2011. Paul Reynaud was a French politician and lawyer prominent in the interwar period, noted for his stances on economic liberalism and militant opposition to Germany. Georges Mandel was a French journalist, politician, and French Resistance leader. Jules Émile Jeanneney was a French lawyer and politician. 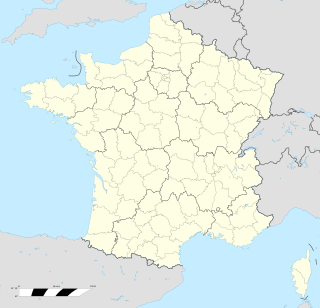 Saint-Jean-lès-Longuyon is a commune in the Meurthe-et-Moselle department in north-eastern France. Justin Godart was a French politician who served as the Minister for Health from June 3, 1932 to December 18, 1932. Léon Jean Jacques Baréty was a French politician who was briefly Minister of Industry and Commerce in 1940. Albert Marc Chichery was a French politician who was briefly Minister of Commerce and Industry, then Minister of Agriculture and Food Supply, in June–July 1940. Louis Marin was a French politician who was Minister for the Liberated Regions in 1924, Minister of Pensions in 1926–28 and Minister of Health in 1934. Jean Marie Albin Édouard Valadier was a French lawyer, administrator and politician who was senator from 1928 to 1945, and was briefly Minister of Labor and Social Security in 1934. Henri Roy was a French politician who was deputy for Loiret from 1906 to 1919 and senator for Loiret from 1920 to 1941. He was Minister of Public Works in 1934–35, and was briefly Minister of the Interior in 1940. Guy de Wendel was a French politician from a family of Lorraine industrialists, who served as deputy and then senator for Moselle, Lorraine. After the fall of France in World War II (1939–45), he voted in favour of granting Marshal Pétain the constitutional powers he had requested. Following is a list of senators of Meurthe-et-Moselle, people who have represented the department of Meurthe-et-Moselle in the Senate of France.